Carla de Guzman is the author of Cities, a self-published book on parallel universes. In the story, Carla explores personal choices and their consequences, which are different in other universes. The novella is set in the intoxicating cities of Seoul, London, New York, and Manila, the perfect backdrop to a story of unrequited love. I talked to Carla to discuss her book, the challenges of self-publishing, her favorite city, and her favorite place to work. Cities is a love story. It’s a love story of four characters, and how their choices change their lives across different cities that they live in. It’s an exploration of ‘what ifs’ and finding a way to deal with situations that we can’t control. Why did you choose to set the story in different cities and timelines? I knew I wanted to write a love story, but I didn’t want it to be a conventional story. Parallel worlds were always fascinating to me, and the idea that there’s a version of myself living the lives I wanted was sad enough that I thought to explore it. 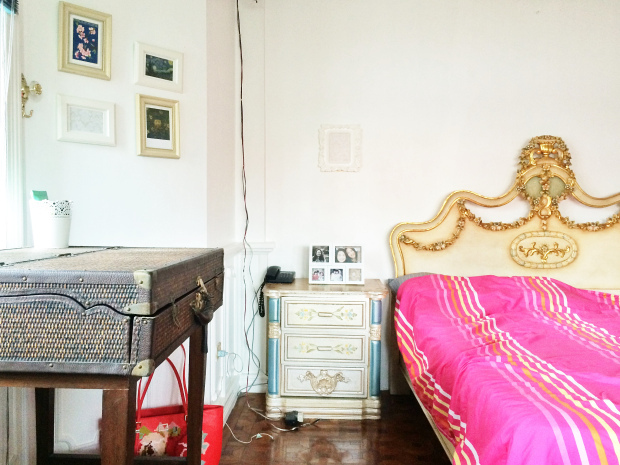 The picture frame above the side table is something I got from Ikea. It’s made of plastic so it can stand to fall once or twice. I framed a rectangle of pretty gift wrapper I found from National Bookstore. I might need to get better sheets, ones that actually fit the theme of the room. Why Seoul, London, and New York? I chose Seoul because I wanted to have my own, slightly Western adaptation of the classic Korean drama Love Square. It’s what convinced me to add Henry and Vivian to the story mix, really, and it was one of the very first things I decided when I chose to expand Cities [from a short story]. It couldn’t have been anywhere else. London came into play after my own trip there. It was a city that captured my heart, and I wanted to let Ben and Celia play out their story there. The outcome changes because Celia has to be closer knit to Vivian than anyone–which I think wouldn’t quite be the same in other cities. As for New York, it was a city that wowed me so much that it scared me a little. I thought it was the perfect place to test Celia and Ben’s relationship. Where did you get the idea for the novella? My sister and I use the bench mainly to put our laptop bags and office/work bags when we get home. It’s super convenient that way. Plus the bottom is a cabinet where I stored all my old notebooks and scrapbooks. This is perhaps the first time all my stuff is put away in cabinets and drawers and not strewn about my desk. London! I think my bias shows a bit, as it’s the longest chapter in the book. But it’s such a fascinating city for me, and still has a lot to offer. Cities was self-published. Why did you decide to self-publish it, and what were some of the challenges of self-publishing? The decision to self-publish came with the realization that (I felt) there wasn’t a place in the Philippines that would treat the book the way I wanted. I decided to self publish to have full control over my story, market it the way I wanted. That was the challenge. While I knew how to manage the business side of things, I didn’t know anything about self-publishing. It felt a lot like riding a bike without training wheels the first time. Add my own insecurities and fears and you’ve got yourself a challenge! Did any book inspire you for Cities? I know that I should say otherwise, but I am a very very shallow reader. I read fanfiction and only a few books, all the other time I write. Alternate Universe is a common fanfiction genre that I think in of influenced the idea of parallel universes for me. The original writing desk I wanted was waay too big, so my Mom generously donated her smaller desk from her room. It’s pretty awesome. On the desk, in bed with my iPad, or in our family dining table when I feel like bonding with my siblings. 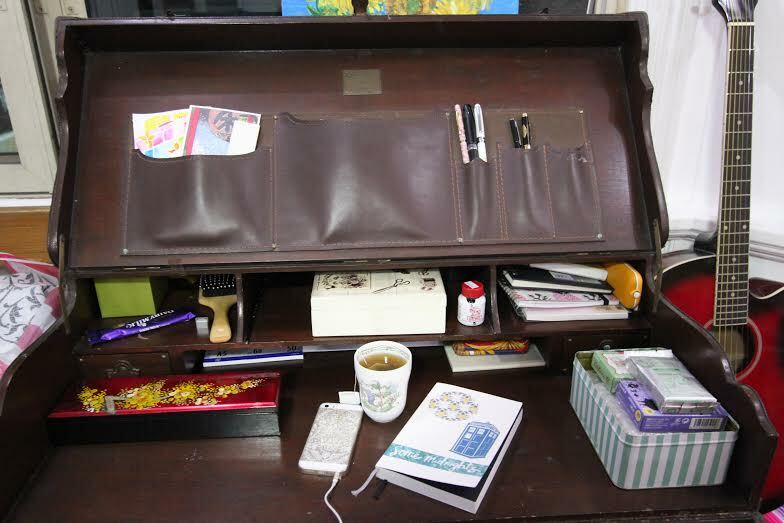 Your desk is actually a bureau in the shape of a suitcase. That’s so interesting. Can you tell us more about it? The desk is actually my mother’s, given to me when we moved to our current room a couple of months ago. 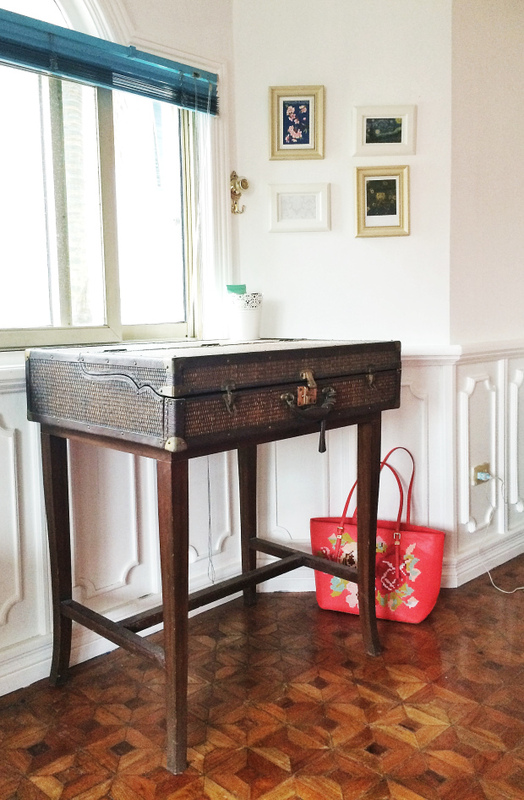 I’ve always loved escritorios or secretary’s desks and when she offered, I couldn’t say no! 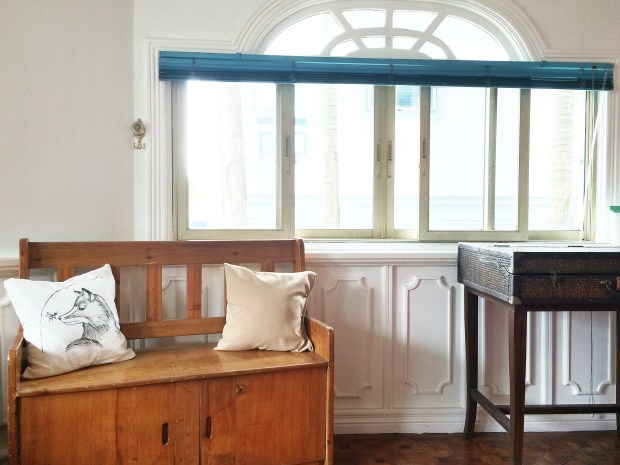 The desk itself belonged to a client who gave it to us in lieu of professional fees. Much like a suitcase, there’s a key hidden in a leather bag on the handle in front of the desk. I have a bad addiction of buying notebooks without filling up the last one. Notebooks, notebooks, notebooks! I have a bad addiction of buying notebooks without filling up the last one. That and two boxes full of pens, pencils, paintbrushes, watercolour and calligraphy ink. Our family has a thing where we all draw and doodle, and this is a manifestation of that. I read that you designed your room. How did you design it? When we found out that we were moving rooms, I had two things in mind. One that my older sister (who is in the room with me) wanted ‘all white’, and that the bed we were getting was this ultra ornate old thing from my grandfather. So I worked around that, adding in what we already had in hand, plus a few DIYs. I always liked monotone and uniform colours, playing only with textures, and that’s what I tried to do here. This is a DIY! It’s pretty simple and unique. 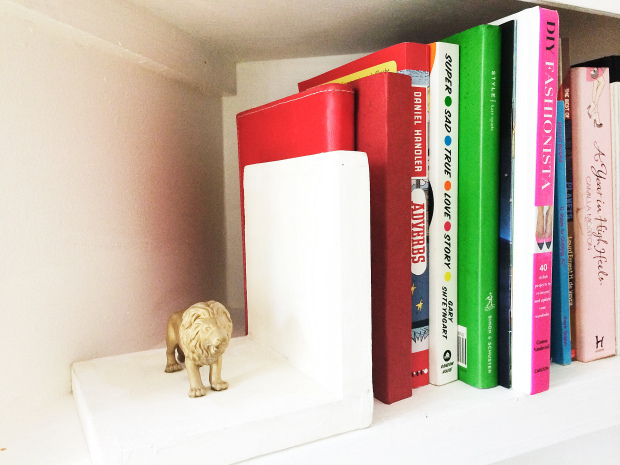 I glued together two pieces of palochina 1″ thick and then glued on the lion that I spray-painted gold. 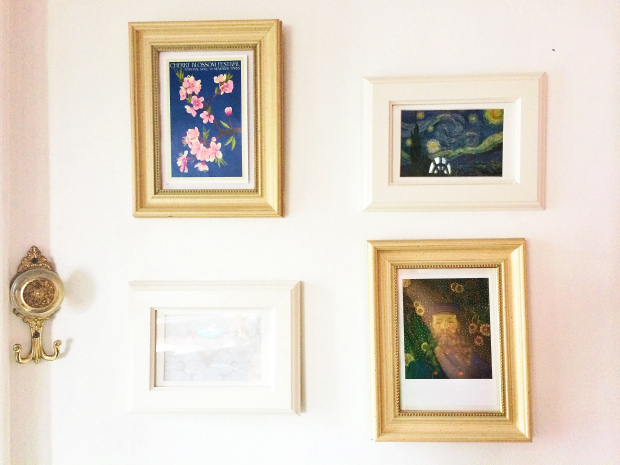 What are some of your favourite DIY projects? I love DIY-ing clothes. [Laughs] Pencil skirts are easier than you think to make, and so are simple t-shirts. That and phone cases. My phone case right now is a clear plastic case that I painted with white acrylic–it looks really nice and unique, and I love that! These are mostly postcards that I’ve collected from my travels. The one on the upper right is from Washington. I got it at the Jefferson Memorial to commemorate the Cherry Blossom festival that we missed by a few days. Then Starry Starry Night and The Postman were acquired at the Museum of Modern Art in New York for less than a dollar each. I have a postcard from the Sherlock Museum in London, but I have yet to find a frame big enough to accommodate its odd shape. In the meantime, there’s always the nice gift wrapper. You also collect postcards. What’s your favourite? My favourite has to be the cherry blossom postcard I got from Washington DC. It looks so unique, since it was a design from the 1920’s, and the colours are so vibrant. I’m never sending that one out! Cities explores parallel universes. In a parallel world, what would you be doing? In a parallel world, I would be writing scripts for Doctor Who, the Catherine Tate Show and Broadchurch in London while travelling to Paris for the weekend. [Laughs] Dream big, right? 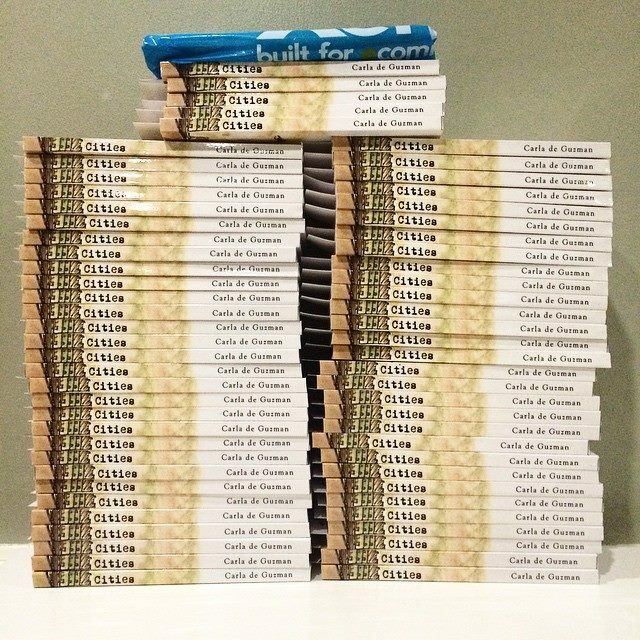 Carla de Guzman’s Cities is available in print and via Smashwords, CreateSpace, and Amazon. To purchase, email the author at ck.deguzman@gmail.com.